A model is a simplification of reality by which specific characteristics are taken out of their context for analytical purposes. Globalization is a recent process that is linking societies beyond the nation-state’s limits through massive ways of consumption, communications, capital and credit management that supersede former borders and pervade political, social and cultural spheres. At least one author thinks that “development” as such was a world goal until the seventies; nowadays, this project has left behind this vision and globalization has taken its place (McMichael 1996). The Cuban Revolution has not had a unique development model throughout its existence. This paper will outline four development models that the revolutionary elite has pursued. Each model has had its own characteristics along the same dimensions: ideological justifications, main strategic sector for growth, emphasis on social investment and quality of life, nature of the economic units, external relations with other countries and interactions with the institutional framework. Finally, on the basis of this evidence, an analysis will be made of the most recent development model and the globalization process. The euphoria of the Cuban revolution’s triumph brought new ideas. They circulated among the bulk of the population even before the former regime was overthrown. They were along the line of similar ideas expressed by social democrats elsewhere in Latin America and the world. For this reason, personalities such as José Figueres in Costa Rica, Rómulo Betancourt in Venezuela and Mexican leaders welcomed the Cuban Revolution as if it were one of their own. The new political discourse embraced democracy as opposed to traditional dictatorships, which were witnessing their disappearance in Latin America, and especially in the Caribbean. Another tenet was honesty in public affairs as opposed to the corruption shown by past regimes. In terms of economic philosophy, they supported the main assumptions of the Economic Comission for Latin America (ECLA) — import substitution and industrialization as the focal points for further autonomy from undesirable external powers and greater independence. Land should be put to work and peasants should have access to markets, generating a new consumption power that in turn would energize industrial growth, the engine for real development. The ideological justification described above increasingly became more radical during this period. Soon the social democratic ideals were abandoned together with democracy and, in practice, ECLA’s advice began to resemble a conservative approach. Nevertheless, the need for an industrial “push” remained in force. The way agriculture had been managed in the past, relying only on sugar, was rejected. The presence of Ernesto Guevara as the Minister of Industries, and the earmarking of more than one hundred thousand hectares of land formerly planted with sugar cane to new crops, demonstrated a willingness on the part of the revolutionary elite to put their beliefs into practice. Above all, the premise of independence from external powers, mainly and almost uniquely from the United States, became a prevailing priority for the revolutionary elite. The Cuban Revolution promised the millenium to the people. During this period, the attainment of a better quality of life was paramount. This need provided the justification for the radical measures taken. The selfishness of the politicians and propertied class of the past was emphasized while massive literacy campaigns, the “Sixth Grade Battle,” the opening of universities to the people, and the universal right to health and housing were constantly invoked. Many goods and services were instantly distributed to those that remained loyal or simply stayed in Cuba, while the upper and middle classes left the island. Even some urban workers felt alienated by these radical measures. Houses that belonged to the people that left the island were distributed to others. This way the revolution touched hundreds of thousands of citizens and provided a strong economic force and vested interest for the Revolutionary Defense Commitees (Comités de Defensa de la Revolución, CDRs) in urban areas. During the 1959-62 period, 37% of the land was expropriated and turned into “Cooperatives” and “People’s Farms”; 85% of the industries became government enterprises; 80% of construction firms were taken over by the government; 92% of the transportation sector went into the state’s hands; 52% of retail trade was nationalized; and 100% of activities in the wholesale and foreign trade, banking and education sectors fell under government control (Mesa- Lago 1971, p. 283). External trade was shifted between 1960 and 1961 from the United States and other non-socialist countries to the USSRR and socialist countries. Thus, around 80% of Cuba’s external trade was conducted with United States and other non-socialist countries in 1960; between 1961 and 1962 around 70-80% of trade became oriented toward the USSR and the socialist countries (Baklanoff 1971, pp. 260-261). This was without doubt a remarkable achievement for the period. A crucial element for the institutional setting to respond to these radical changes was the kind of leadership Fidel Castro exercised vis-a-vis the revolutionary and mass organizations and the state. This period was overwhelmingly charismatic. The new regime was able to extirpate any organized opposition and became free to implement its own unilateral project for the development of the island. The “July 26 Movement,” the political organization led by Castro, that galvanized the opposition against Batista, played no role during the period. On the contrary, many leaders that were part of the movement were discredited, persecuted, jailed or became exiles when they were perceived as joining the opposition. The remaining revolutionary forces, such as “Segundo Frente del Escambray,” followed the same path and even some of their “Comandantes” were sent to the firing squad. The revolutionary student movement “Directorio Revolucionario Estudiantil,” remained quiet and remarkably collaborative despite some exceptional cases that resulted in indivuals winding up in jail or in revolutionary organizations in exile. The lack of legal opposition forces, the successful containment of revolutionaries belonging to different organizations and mild opposition to collaboration from political organizations that had certain autonomy, such as Directorio Revolucionario, paved the way for Fidel Castro to exercise his charismatic qualities. Television appearances of many hours became a formidable instrument for a direct relationship with the masses. Since 1960, the population was inserted in a network of mass organizations such as the Federación de Mujeres Cubanas, la Asociación de Jóvenes Rebeldes, “Pioneros,” Comités de Defensa de la Revolución, “Con la Cruz y por la Patria,” etc. Simultaneously, the state was freed from elements belonging to former governments and played into the hands of the new revolutionary elite whose commanding officer was Fidel Castro. All of these forces, were put to work for the development model of an accelerated industrial society capable of eradicating poverty and making Cuba an independent country. This model may be subdivided in two stages that extend from 1963 to 1966 and from 1966 to 1970, as Carmelo Mesa-Lago (1979, pp. 20-27) has suggested. The first stage witnessed the first attempt to model Cuba after the Soviet Union in a coherent and integrated way, while the second again introduced a radical independent movement in the political sphere and in the domestic economy, but without altering fundamentally the economic dependence on the Soviet Union. Finally, there is a two-year period (1968- 70) in which close relations with the Soviet Union again take place, preparing the scenario for a different model in the seventies. A constant is the emphasis on sugar and agriculture. For this reason this model may be depicted as having ambivalent political purposes, with sweeping changes in relation to the USSR. Initially it goes in the direction of closeness to the USSR, then it takes a radical independent path and finally returns to the original trend. The shift from the development model of 1959-62 is marked by a paradigmatic event: the signing of a commercial treaty between Cuba and the USSR that launched a new stage for the goals of the revolutionary elite. This event was preceded by a long discussion within the higher revolutionary circles about Cuba’s industry as an engine of economic growth and a vehicle for enhancing the quality of life promised by the Cuban Revolution’s leaders. The scenario at the end of 1962 was not promising: sugar production had significantly diminished and food rationing, adopted as a provisional measure, seemed to become a permanent measure affecting the quality of life of the Cuban people. The disorganization of the state meant that it was not able to cope with its new massive responsibilities. A symbol of this disarray was the arrival at Cuban ports of whole industrial plants ready to be assembled that government officials could not put into operation. The “star” of Ernesto Guevara, the promoter and defender of rapid industrialization policies, began to decline significantly. Suddenly, he was dismissed from all his responsibilities and he moved his base of operations to Africa in search of new endeavors. Sugar ceased to be the symbol of “imperialist” influence and the dream of a Cuba free of the influence of the United States and the USSR was left behind. Sugar, according to the new discourse, was in fact the basis for such independence. It was the skill that Cuba knew well and could share in a socialist division of labor. A schedule for delivery of Cuban sugar to the USSR contained within the bilateral commercial treaty with the USSR would require that Cuba produce ten million tons of sugar by the 1970 harvest. A new development model was installed. Agriculture — and not industry — was the pivot for reaching the millenium. Sugar was the product that would provide the basis for prosperity in the long term. Nevertheless this shift was a pragmatic concession made by the revolutionary elite. The goal was economic autonomy within the framework of socialist triumph elsewhere in the world. However, the new revolutionary regime was lacking credentials in the socialist world, with COMECON, the economic organization formed by the USSR and European socialist allies, not giving a seat to Cuba during this period. Vietnam was the main challenger to U.S. hegemony in a polarized world. The pursuit of agricultural development with the support of the USSR did not contradict the global policy of weakening the United States in its backyard. Domestically these changes needed an iron hand, a new revolutionary awareness, in one word, “a New Man.” Economic stimuli could not be offered. Instead of relying on military means to force people to give their extra effort to accomplish revolutionary goals, “conciencia” (consciousness) was needed. In this context, the ideological elaboration of Guevara regarding the importance of “subjective factors” in the revolutionary struggle was relevant. Guevara could have had this scenario in mind considering that the direct confrontation with the United States had been exhausted after the missile crisis. The USSR would not mind much this approach, except for the complaints of their traditional allies, the network of communist parties in Latin America. This contradiction was already solved in Cuba after the trial and death sentence of Marcos Rodríguez (1964), a Communist Party affiliate and confidant of Batista’s repressive forces. His cooperation with the Batista government led to the loss of life of well known student leaders during the revolutionary struggle. In addition, the denunciation by the revolutionary elite of the “microfaction” (1968) that sent Anibal Escalante, a prominent “old guard” Communist leader, to confinement in a collective farm, proved that no intermediaries were needed between Fidel Castro and the USSR. The revolutionary regime and Fidel Castro himself fought for this representation and won it. Another Communist Party different from the one that emanated from the Cuban Revolution was not permissible. After all, the Communist “Old Guard” were Batista’s allies in the 1940s and they did not participate in the Sierra Maestra’s struggle until the very end. The minimization of the old Communist Party provided the basis for the Cuban revolution’s leadership in the rest of Latin America. Guevara’s adventure in Bolivia would have been unthinkable without a satisfactory solution of this contradiction within Cuba.1 The call for a revolution in the continent belonged to this new generation that was in search of a new party rather than an established one with an aging leadership. This contradiction, however, confronted Guevara in Bolivia, when the Bolivian Communist Party questioned his credentials to lead the revolution in that country. Nevertheless, during this period, reacting to the discredit and exclusion of its traditional Communist Party allies, the USSR partially cut its oil exports to Cuba, a warning that alerted the revolutionary elite with respect to the fragility of their relations. During the first years of the revolution, economic units followed centralized management techniques derived from similar experiences in the USSR. By 1963, a second agrarian reform put 70% of agriculture under state control. Adding to the first wave of expropriations, 95% of industry, 98% of construction, 95% of transportation and 75% of retail trade were under the control of government ministries. These measures added to the total control that already existed over wholesale and foreign trade, banking and education. Soon, the revolutionary elite realized that they needed greater centralization and less technocratic management and measures (1965). Economic units were literally put under each Minister’s command. Finally, virtually the entire economy was put under the state’s control (1968) with the exception of the 30% of agriculture that remained in private hands. Increasingly, economic units were managed without any relationship to the market, departing considerably from the Soviet model and other socialist experiences. On the contrary, emphasis on “conciencia” were reminiscent of the Chinese’s “great leap forward” at a moment when tensions between the USSR and China were paramount. Castro’s dismissed any doubt about a possible alliance straining their relationship with the Chinese in 1966. During this period, around 75% of exports-imports were already being conducted with the socialist world, a figure that remained remarkably stable until the crisis of the nineties. Despite the efforts to build technical and autonomous institutions and economic units at the beginning of the period, the relationship between the revolutionary elite, the state, the party and mass organizations showed a clear direct relation between Fidel Castro followed by his loyal comrades and the masses without any other intermediation. This charismatic order, based on Fidel Castro, intensified to tremendous proportions in the mid-sixties despite the formation of a political party, the so-called “Partido Unido de la Revolución Socialista (PURS),” which grouped the main revolutionary organizations in the struggled against Batista. The only purpose of the PURS apparently was to check the ambitions of the “old guard” of the Communist Party to become the intermediary between the revolutionary elite and the USSR. The identification of the top positions of the state apparatus with the revolutionary elite was complete and at the end of the period there were no differences among the revolutionary elite, the state, the diminished political party and the mass organizations. The top leadership circulated horizontally among all these entities. Above them, Fidel Castro presided over the most minute details. The period between 1968 and the 1970 provided a link for the implementation of the new model. Sugar would not be the basis for growth at the expense of the rest of the economy, according to the new ideology. More important was the modernization of the economy and its place in the context of the socialist world with which Cuba had relations. The domestic political system should not constitute a grouping of institutions with the same purpose. The building of a political system that differentiated among state, political party, mass organizations, the revolutionary elite and “the Maximum Leader” was needed. The latter should give rise to an institutionalization of the revolution. Institutions, not men, were the goals of this period. There were deliberate efforts to separate out administrators from the Party. The brand new Cuban Communist Party celebrated its first Congress in 1975 and approved the SDPE (Sistema de Dirección y Planificación de la Economía, Economic Management and Planning System). The SDPE would be based on “objective economic laws” and consider market mechanisms such as earnings, credit, interests, rational prices, budgets, and economic calculus, especially regarding firms’ self-financing, taxes and transactions among state enterprises. Firms would also enjoy a relative independence, e.g., to hire its work force, seek loans, make investment decisions, establish accounting systems and seek earnings (Mesa- Lago 1979, pp. 69-70). Work norms were again implemented at the firm level. There was a return to long term planning together with emphasis on the training of managers, who were forced to learn the new technology with warnings that failure to do so may bring firing and rotation of personnel. Moreover, material incentives were introduced to reward economic performance and criticism leveled at the “voluntarism” that was practiced in the context of the application of the former model. As a result, voluntary labor declined considerably, absenteeism was checked and increases in productivity sought. New and more specialized ranks were introduced in the armed forces, which were also reduced in size. Meanwhile, the older, voluntary militias started to disappear. All these changes were made in the midst of self-criticisms on the part of the revolutionary elite and Fidel Castro regarding “the mistakes of the past” based on voluntarism and subjectivity. A moderate reduction in capital accumulation and an increase in consumption improved the quality of life of the people. During this period, Cuba enjoyed moderate economic growth and was able to keep active social policies. Cuba’s performance in this regard looks more outstanding when compared to the rest of Latin America, which engaged in massive borrowing that created a huge external debt and later on in duced structural adjustments of their economies and considerable reductions of their social expenditures by the end of the seventies and well into the eighties (the so-called “lost decade”). Although times series differ, especially for the period 1960-64, the magnitude of the outburst of the economy between 1970-75 — around 7.5% according to Mesa-Lago (1987) and 10% for Madrid-Aris (1997) — and for 1980-84 — 5.7% for Madrid-Aris (1997) — seems to be well established. Other authors show lower growth in the sixties, around 2.25% for Madrid Aris (1997) and 2.3% for Mesa-Lago (1987) for 1960-70; around 3.4% for Madrid-Aris (1997) and 4% for Mesa-Lago (1987) for 1975-80; and 1.3% for Madrid-Aris (1997) for 1985-88. Summarizing, it is possible to conclude that economic growth in Cuba from 1960 to 1980 was average in the context of Latin America growth (around 4%). It was better than Latin America’s during the “lost decade,” but trailed the 5.3% median growth rate of the Newly Industrialized Countries (NICs) (Singh 1998, p. 250).3 In any event, the extraordinary external conditions that prevailed during this period makes the Cuban model almost impossible to replicate — attempts to do so in Chile and Nicaragua ended in failure. This period witnessed the close alignment of the Cuban economy with the rest of the socialist world. This is what makes the Cuban experience unique. At the beginning of the seventies (1972), Cuba obtained a seat in COMECON; this put the USSR in a position similar to that held by the United States vis-à-vis pre-revolutionary Cuba, even in details such as the share of foreign trade conducted with the island and the preferencial sugar paid to Cuba. In addition, the external aid given to Cuba during the period exceeded any amount provided to any developing country in the world in a similar situation. Between 1970-80, Castro made 4 visits to the USSR and Brezhnev made one visit to Cuba. Never again would Cuba enjoy such levels of preference. Judging from the outcomes at the end of the eighties, probably never had the revolutionary elite faced more hidden resistance to their goals. Complaints about “irrational investments by the USSR in tropical revolutionaries” that were unheard in earlier periods began to be aired. The caution of the USSR with respect to the help given to the “Sandinistas” in Nicaragua was the consequence of this internal criticism of over-generous aid to Cuba. Overall, one wonders how it was possible for the critics to accept such generosity when Cuban goals in the social area aimed to elevate social indicators beyond those enjoyed internally in the USSR. An examination of social indicators as a measurement of quality of life, originating from different sources, shows that the Cuban regime during this period made significant inroads in the areas of employment, education, health and social security. Nevertheless, these achievements were made at a great cost for the overall economy and its sustained growth, as the process of capital accumulation and the investment rate show. A more thorough study of these advancements makes evident a heavily subsidized labor, social and consumption sector. Comparisons with Chile and Costa Rica, countries with different ideologies (Pinochet in Chile and democratically-elected leaders in Costa Rica), regarding education and health show comparable advancements under different conditions. Thus, technology may be more important than ideological framework in such advances. The advances made during this period would have been impossible without a close political agreement between the USSR and Cuba. The model did not resemble the thesis of “socialist development in one country” as the Stalinist period may show, although certain domestic similarities may be highlighted. Castro complained about criticisms made by the Latin American left regarding his concern for development and the abandonment of the “permanent revolution” beyond Cuba’s borders in the area. He justified his pursuit of development as also revolutionary, but this ingredient was not the main characteristic of the period. In short, the military has been by far the most “dynamic” sector of the Cuban economy for at least a decade. The Soviets have paid most of the economic costs in this sector…Many commentators maintain that Cuba’s foreign policy reflects Cuba’s own interests. However, it is not plausible a country of Cuba’s size, location, and precarious economy would, in its own interests, have 70,000 troops and military advisers in 23 countries around the world, mostly in Africa and the Middle East. Institutionally, a good effort was made to separate out state administrators from the party and even from the armed forces. Nevertheless, the interplay of Castro’s charismatic personality, mass organizations, the state and the party was difficult to overcome. Among the most interested in the rule of law were the former Communist Party members — the “old guard” — who had seen many of their peers taken to trial and condemned publicly. They, more than anyone else, could benefit from “socialist legality.” The Constitution that was approved in 1976 established a government structure similar to the USSR. Within the central administration, there was separation of the legislative and executive functions (previously concentrated on the Prime Minister’s Cabinet). The Communist Party began to have an importance it did not have in the past. The same happened with mass organizations. The workers’ movement witnessed a revival through elections at the local level, union reorganization and periodic national meetings. There was also pressure to integrate the agricultural private sector into the state, following the practice in Eastern Europe. In addition, the youth movement, through the Communist Youth Union (UJC), received special attention to strengthen its capacity to cope with students abandoning school and with any rejection of accepted practices through rebellious behavior. The same applied to culture and intellectuals, seeking to gain the affiliation of writers, journalists, visitors from Western intellectual circles and judges in national literature contests. Nevertheless, though one may observe a greater sophistication and diversification in the formal power structure, this period could not erase the pervasive influence of Fidel Castro in all affairs. Elite horizontal circulation intensified among the inner circle at the top of party, state, armed forces and mass organizations. Castro dedicated a large amount of time to war games in distant countries and geopolitics. Any sense of crisis, however, immediately brought him to the fore. The most critical situation came around 1986, after Mikhail Gorbachev became general secretary of the Communists Party of the USSR. This resulted in a new situation that unexpectedly challenged the URRS-Cuba agenda. For the first time, a generation that did not live through the Russian Revolution was in power in the USSR. For the first time, Castro had to face a generation of leaders in the USSR that were younger than he. His political instincts told him that this was change was capable of jeopardizing the honeymoon Cuba enjoyed with the USSR for fifteen years. Winds of change began to blow again and a new model began to emerge. The fact that the model we are describing starts in 1986 may raise doubt regarding the link between the “Special Period” and the previous events. From our perspective, they are part of the same underlying trend: the revolutionary elite’s search for formulas to cope with the new agenda put forward by the USSR. The events that began in 1986 were a prelude to the fall of the Berlin Wall in 1989 and the demise of Marxist-Leninist regimes in the USSR and Eastern European countries. The justification for beginning “la rectificación de errores y tendencias negativas” in 1986 was the disgust of the revolutionary elite with the effects of SDPE for 10 years. This line, however, was the official version told to the Cuban public. Underlying this official rhetoric was a concern about the alliance between Cuba and the USSR and the decline of Soviet geopolitical influence in Central America, Africa and the Middle East. Consequently, Cuban international missions declined. The SDPE, the Soviet and Eastern European model adapted to Cuban realities, became the “scapegoat” of all evils in Cuba. There was criticism of inequalities brought about by market mechanisms permitted within the SDPE. Peasant, artisan and housing markets — where producers and consumers freely came to buy and sell their products — were eliminated. The disappearance of voluntary labor was regarded as negative and such practice was reinstated. Similarly, the importance that had been given to technocratic approaches over political considerations was deemed to have become a source of deviations that should be corrected. All organizations were called upon to discuss ways in which they could “rectify” ideological and practical incongruences of the system installed in the seventies. The ethical drive, however, was not a return to the 1966-68 period, but moral stimuli was praised over the materialistic approaches attempted by those that allegedly did not understand the Revolution’s high moral goals. Corruption was particularly attacked as well as profiteering from the “black market” using state’s resources. Ernesto Guevara’s figure was resurrected but without the intensity of the past. Thousands of meetings to drum up support for the new campaign were held throughout Cuba for several months. All accounts of economic performance during this period show that the economic growth rate declined when compared with the former period (Castañeda and Montalván 1996, p. 222). Jorge Pérez-López (1998, p. 225) mentions that there was a recession that intensified in the 1990s. The return to old banners did not work as expected. Economic problems worsened instead of being rectified. What looked like a temporary reform cycle, perhaps to consolidate the bargaining position of the Cuban revolutionary elite with respect to the changes taking place in the USSR, became a permanent farewell due to the political changes and transitions to capitalism experienced by the former allies in COMECON. The impact of the breakdown in economic relations differs according to different authors, but without any doubt Cuban economic activity declined between 39 and 50% in the 1990-93 period (Pérez-López 1998, pp. 226-7 and CEPAL 1997, p. 626). The real magnitude of the debacle probably will never be known, but the disappearance of COMECON made transparent the subsidies given to Cuba. Preferential sugar prices disappeared and sugar trade was transacted at world prices as was also oil. When the Fourth Congress of the Cuban Communist Party met in 1991, most expected drastic changes in the direction of democratization and economic liberalization. This was not the case although the government subsequently relinquished control of some aspects of the economy and encouraged some private activity. The most important measures were the allowance of joint ventures with foreign investment operating outside the official economy and the liberalization — to certain extent and without completely losing control — of certain corporations, especially those engaged in foreign trade. In addition, the government proceed to give more independence to the farm sector, legalized the use of dollars by Cuban citizens and made self-employment legal. In addition to these defensive measures, the “Special Period” forced the revolutionary elite to make an extraordinary effort in tourism. Tourists visiting Cuba have risen from a little more than 400 thousand in 1990 to 1,440 thousand in 1998, almost a four-fold increase, making this activity the main source of foreign exchange (US$1.8 billion). Other efforts in nickel exploitation and oil production are either volatile or not significant enough to make an impact on the crisis. This new model brought some economic revival to the embattled Cuban economy. By all accounts, the years 1994-99 witnessed positive economic growth but indicators showed some volatility. From 1994 to 1996, GDP growth rates were 0.4, 2.5 and 7.8%, respectively. It appears, then, that the success reached this last year and the confidence that the Cuban economy had reached bottom in 1993, made the drive toward further changes fade somewhat between 1997 and 1998. According to official data, 1999 witnessed again a strong recovery, 6.2% according to official sources, which has been challenged (Castañeda 1999 and Maybarduk 1999). The historic levels reached by Cuba in social expenditures and social indicators suffered with the economic decline though there has been a conscious attempt on the part of the revolutionary elite to maintain these levels.4 The CEPAL study showed that real salaries dropped 41.4% compared to 1989. State budget expenditures in education declined 46% from 1989 to 1996. Salaries of teachers maintained their levels, but severe cuts have been made in expenditures on supplies and text books as well as in capital formation. Laboratories and workshops that need equipment and materials have suffered together with students housing to which food and transportation have been difficult to provide. This situation has affected all levels of education, but to a greater extent higher education, especially careers such as biology, chemistry and veterinary science where considerable equipment and investment is required. According to CEPAL, the Cuban government expanded and kept satisfactory levels of public health until 1989. Since then, imports to support this sector began to suffer. Assistance received from COMECON countries stopped, and the allocation of foreign exchange to purchase medicines, equipment, medical instruments and so on declined from US$237 million in 1989 to only US$66 million in 1993. It increased again from 1994 to 1996 (US$90, US$108 and US$126 million, respectively). Self-financing through medicine exports, remittances from Cuban medical doctors outside Cuba, attention to international patients, etc., only reached 15% of the needed resources. Regarding public health, the CEPAL study concluded that massive preventive measures taken by the government before the crisis has allowed Cuba to maintain the historic public health levels and at the same time has supported austerity measures and reorganizations made as a result of the crisis. Nevertheless, the pressure on the available capacity is such that it is foreseen as shortening the life span of needed health equipment. Assistance given by the European Union and non-governmental organizations has also eased the situation. Housing has never been a sector about which the government can feel proud. Despite reforms introduced in 1985, the housing situation has tended to worsen. The same can be said of community services related to housing. The CEPAL study noted that during the Special Period, difficulties in the public water and drainage systems were severe. Garbage collection has also deteriorated. Some “cuentapropistas” (small, private entrepreneurs) have started to provide some of these services. Finally, the culture sector has been more successful than recreation, physical education and sports in attracting financing from abroad for its activities. The CEPAL study, however, sees difficulties in the future related to imports. Sports, like culture, faces the dilemma of commercializing activities abroad to raise foreign exchange, and raises doubts about genuine “amauterism.” The equilibrium is precarious at present. Cuba today faces an institutional crisis that has been brought by the same measures that are being used to defend the system. The elitist inner circle has closed ranks around the charismatic personality of Fidel Castro, whose age calls for a clear picture of a successor. Nevertheless, this subject is not touched and each time the question is asked of Castro, he answers that there are permanent institutions in the island formed throughout the last forty years that will take care of the matter. The armed forces have raised their status during the Special Period, and many officers are carrying out their official duties being directors of firms related to foreign trade. Privileges attached to these posts have increased the differences between these managers and the bulk of the population. State technocrats that were successful during the decade when the SDPE was implemented are kept at a distance by the revolutionary elite. The opening of a dollar area around tourism and the priority given to certain strategic firms may have created wide differences depending on where a person works. Loyalty is preferred over expertise. The debate over the future of the island has intensified and polarized. The sudden dismissal of Foreign Minister Roberto Robaina is proof of this statement. The cautious approach of the liberalization measures, which slowed down in 1996, must have created further discussion on how to exit the critical situation. A serious analysis of the alternatives Cuba has for overcoming the Special Period raises important questions. Cuba has no hard currency to engage in significant trade with Western countries. Former socialist countries are part of the problem and hardly can provide solutions at present. China does not appear to be a significant and viable partner to accompany Cuba in this endeavor. The critical situation described above surprised Cuba while it had the same old charismatic order in place. The state apparatus called to face this situation appears fragmented. The reward system tends to be concentrated on certain economic sectors and in the hands of people loyal to Fidel Castro and the revolutionary elite. Mass organizations play a lesser role than in the past except when they need to mobilize the population on issues such as the Elian case or more recently on the “Adjustment Law” and the embargo. This kind of mobilization tends to strengthen the link between the charismatic leader and the mass organizations directly, without any intermediary. This is the model that Fidel Castro has used in the past in times of crisis. Intermediary organizations such as the Communist Party or the state are a disturbance. This is an element that does not help in seeking solutions that could give Cuba a pathway to the twenty-first century. Cuban foreign policy has always been global out of both necessity and principle. In the early 1960s, U.S. policy sought to enlist the assistance of other countries to isolate and overthrow the Cuban government. Survival of revolutionary rule required the sear for support everywhere; this is the foundation of Cuban Soviet relations….Cuba’s entry into the Nonaligned Movement in 1961 and its continued membership throughout that decade was consistent with the need for global support…The Cuban government’s foreign policy is global also because of the ideological commitments of its leadership…These are not parochial revolutionaries…Cuba’s global policies spring also from an analysis of the shifts in the so-called “correlation of forces”…A final aspect of Cuba’s global policies is its assessment of the relative opportunities and efficacy of assistance to revolutionaries the world over. Thus, we have to conclude that despite all the isolation that can be cited, in at least one area — foreign policy — Cuba has been global. Another question is the development policies followed in the described models. The development model between 1970 and 1985 was the most integrated with the outside world, although it was framed within the most intense “Cold War” mentality. During this period, Cuba acted as a complement of global Soviet policies all over the world. During the second development model, the vision of Guevara weakening U.S. imperialism by opening other fronts in Latin America and selecting a location in Bolivia capable of extending revolutionary warfare to Argentina and Peru, also contributed to this global trend. Of all the development models followed, the present one seems the most isolationist one. There are no international missions. Cuba is not integrated into the Western world and its links with the developing world are tenuous and without dynamism. The small economic diversification Cuba developed during forty years now constitutes a hindrance for expanding its relationships with other countries. Cuba has not developed economic platforms in a large scale as China has done. China has attracted massive investments from countries that ideologically are far apart, as Hong Kong and Taiwan. The Cuban enclave in Miami, on the contrary, is regarded as a visceral enemy. Still, tourism, the most dynamic sector of the current Cuban economy seems to have global ingredients. Nickel and oil can be discarded because their contribution to the overall economy is not significant. Tourism, however, finds enormous obstacles to really globalize the island. Tourism enterprises are not able to hire labor freely in the island. A complicated government system provides the labor requested and corporations pay salaries to the government; the government in turn pays the workers after taking a significant share. Spanish and Canadian corporations are competing for the potential earnings of this sector. Recently, small margins seem to be discouraging tourism investments due to conditions put forward by the Cuban government (Maybarduk 1999, p. 2). These multinational corporation have firms all over the world and may shift their geographical interests if conditions worsen for them, a negative aspect that is part of the globalization process. Only by presenting competitive advantages to foreign investors may Cuba overcome this tendency. There is no political will yet that may encourage this trend but if the Cuban government decides to do so, tourism is the best candidate to start with. 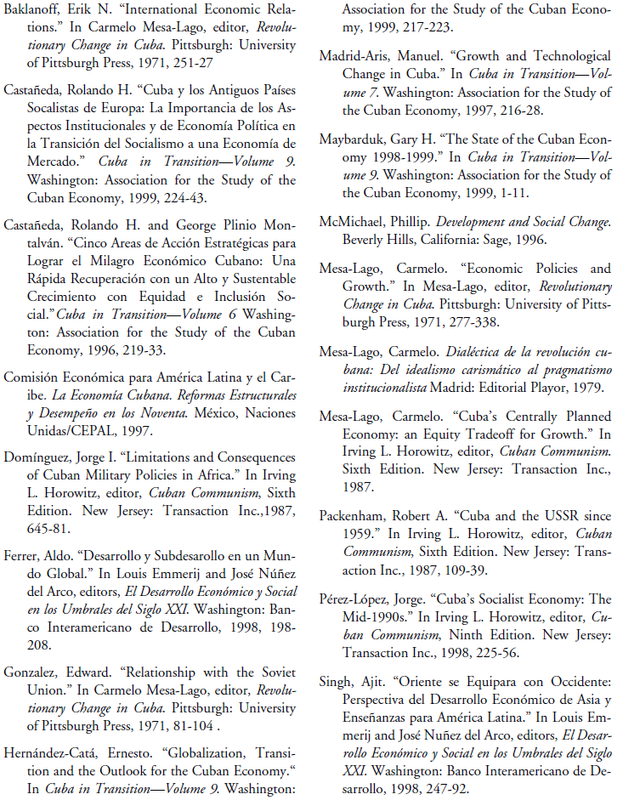 This paper has distinguished four development models pursued by Cuba since the victory of the revolution. Ideological justifications for each model have changed from one period to the other to come back again to the same discourse. This has been a tireless exercise throughout time. Moral stimuli displaced other justifications at the end of the sixties only to appear again more than twenty years later to justify the Rectification Process and the Special Period. The most efficient model was the one executed between 1970 and 1986. It provided the economic base for more ambitious goals but it was aborted when a new elite emerged in the USSR, breaking the close alliance enjoyed by Cuba for more than fifteen years. Voluntary labor, mass mobilizations, emphasis on moral stimuli, and charismatic relationships that prevailed between 1966 and 1970 and between 1986 and 1990, had a bad economic record. The same happened in China with “The Great Leap Forward” and “The Cultural Revolution.” During these times, idealism is invoked and heroic deeds are praised. Loyalty and revolutionary fervor are considered worthy for the people to practice. Dissident forces are excluded and mass mobilizations become part of ordinary life. Economic activities decline as a result. At present, during the Special Period, these calls are beginning to be more frequent since the Elian case became a rallying point for the revolutionary elite. If these mobilizations become frequent, negative economic effects may interfere with planned goals. What comes up clearly is the current isolation of Cuba from the world economy. Political and economic relationships with other countries have become difficult given the present economic model. Politically, the regime is vulnerable to campaigns undertaken elsewhere to press for a government with greater respect for human rights, a greater emphasis on democratic principles and procedures and a more tolerant policy toward dissidence and opposition. The majority of countries condition help on democracy, political concessions and liberalization of the economy. In addition, the Cuban government has very little to offer and has no hard currency to back up its intentions. The Cuban government saw the transition in the former socialist world as a withdrawal from revolutionary ideals. “Glasnost” and “Perestroika” are regarded as ideas that precipitated this failure. For this reason, they are excluded from the revolutionary agenda. In taking such a stand, however, Cuba becomes more excluded and isolated in a world that becomes more global. The global strategy of the seventies and eighties worked for Cuba, but the world has changed and Cuba has to find its place in this new world. The advice given by Juan Pablo II is relevant: “Cuba has to open itself to the world, and the world has to open itself to Cuba.” Otherwise, the current development model could result in a tragic end. 1. A good account of the tensions during this period may be seen in González (1971). 2. I acknowledge that in this section I borrow liberally from Mesa-Lago (1979), especially pp. 20-27. 3. This is also the conclusion of Ernesto Hernández-Catá (1999) regarding NICs. 4. The situation described below has been taken from CEPAL 1997, pp. 359-82.